Rahul Gandhi does look surprised as the garland appears to come from nowhere and plop down around his neck. 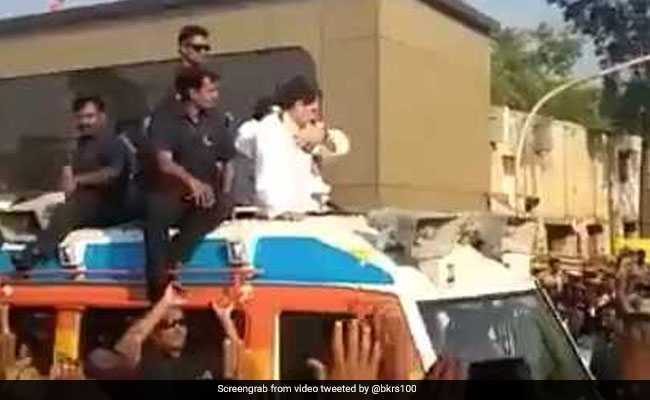 Bengaluru: Rahul Gandhi waves at a crowd from his open top SUV at Tumkur in Karnataka when suddenly, a garland comes flying and lands neatly around his neck, startling him. The video has gone viral on social media. One of the first to post the garland video was Rakshith Shivaram, the secretary of the Congress's Karnataka unit, who called it a sign ahead of the state elections on May 12. Rahul Gandhi does look surprised as the garland appears to come from nowhere and plop down around his neck. The spot-on aim is appreciated by many on Twitter, but quite a few flag security worries. Some reports suggested that the administration is investigating whether it was a potentially dangerous security breach; the 47-year-old Congress chief is among India's most protected politicians with special commandos guarding him at all times. One tweet recommended that one of the security men with Rahul Gandhi should be "fired" for not blocking the garland. The garland is significantly better than other missiles that often embarrass politicians in public - shoes, sandals, tomatoes. Rahul Gandhi is on his fifth round of campaigning in Karnataka, one of the few states in which the Congress is in power. Rahul Gandhi faces a tough challenge in the form of an aggressive BJP determined to wrest another state from the Congress. Rahul Gandhi is practically retracing BJP president Amit Shah's steps by travelling to districts like Shivamogga, Davangere, Chitradurga, Tumakuru and Ramanagar district. 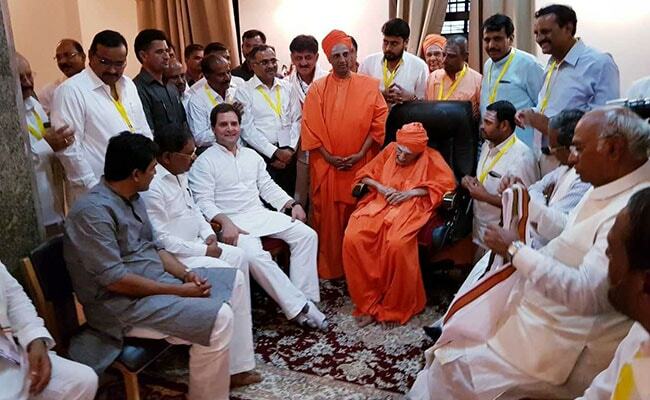 In Tumkur, he visited the Siddaganga mutt, a Lingayat centre where he sought the blessings of Sri Shivakumara Swami, a 111-year old seer.